The vendors I use at our farmer's market never complain about loose fruit. They also respect my request for no bags. When I see what I am going to buy is problematic (ie 2lbs of beans) I whip out my EcoSacs. I usually only have 1 or 2 so I can't put everything I buy into them. I have even heard the occasional other person request no bags too! This is an awesome idea!! I hope to use this for gift giving this year...lots of people in my family said they would use cloth bags if they had them =) Thanks for the tutorial! Great idea! Used bedsheets might work well too... I'm inspired to go make some. I've got some cloth produce bags I've collected here and there. From The Organic Needle, ReusableBags.com and a farmers' market vendor but I could sure use me some more. Now I just need access to a sewing machine. Oh yeah, and an old shower curtain. I may have to go with Carmen's suggestion of an old bed sheet. Of those we have plenty. 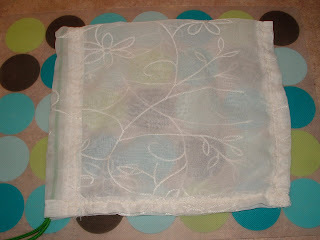 I bought lioli pog sacs, unbleached whole and netted produce and grain bags- I can wash them easily! That is an absolute brainwave, using a shower curtain for the material! 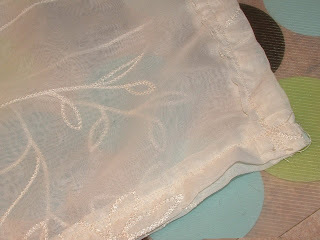 More and more, I'm thinking I need a sewing machine. Mum has one - but she's 3000 kms away in a different country! Hmmm, I'll ask Santa, I think! @Billie - You're lucky that your vendors are good about not using plastic bags. The problem with mine is that it's the state farmers market, so it's huge and very very busy. I think my failure at not using the plastic bags has as much to do with me feeling the chaos and pressure of the crowd as with the farmers being busy and in a hurry. We're lucky to have such a big farmers market though! @DramaMama - I hope your family enjoys them as much as I have been! @Carmen - Bedsheets would work great too. The advantage of a shower curtain is the sheer factor, but that's not necessary. @Green Bean - Bedsheets would be perfect. I've also seen some cute bags made out of t-shirts. @Over Coffee - Glad you like it! 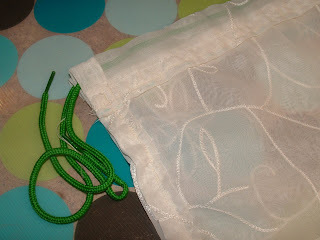 @Eco Yogini - I was leaning toward getting some of those netted produce bags, but the free aspect persuaded me to make my own. I still covet the net bags though. They are so cute! @daharja - I'm hoping Santa will bring me a sewing machine too! I use organic hemp ones. Awesome! Those old sheer window curtains can work well too. 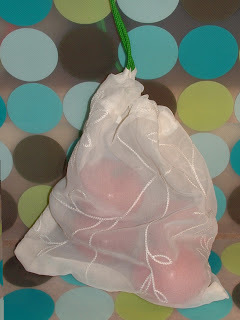 Plus, if you have a local fabric store, it's fairly cheap to buy a couple of yards of cheap muslin or even tulle (you know, ballet tutu stuff) to make a whole bunch of these bags. Anoter trick--if you have any old change purses or little pouches kicking around (or...blush...the free cheezy cosmetics cases from before you went green and got tons of heavily packaged freebies from cosmetics counters...or was that just me? 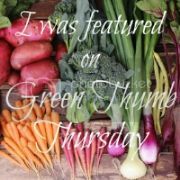 :-), keep one in your car or purse, stuffed full of these very collapsible little produce bags, for the day you forget them. (Or is that just me too?). Or heck, make one yourself! Great idea! 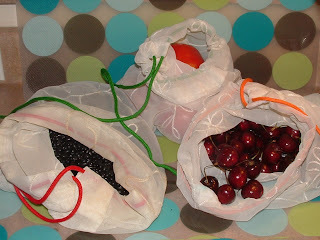 I havea vinyl bag (freebie from school book orders) that I use for large quantities of messy things like berries. The shower curtain bags would serve the same purpose. Thanks for sharing! @Lisa - Thanks for adding that important note. No on vinyl, that is final! 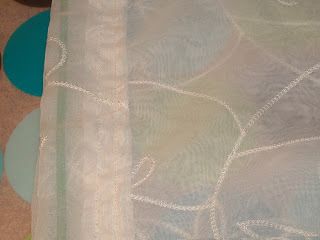 @Jennifer - Ooooh, I think I have some old sheer curtains up in the attic! Great idea! And I love the idea of using a change purse or cosmetics case to put them in. @Daisy - Glad you like them! great idea. I have some of the mesh ones I bought many years ago to avoid this problem but some stuff like greens and beans need to be in plastic of sort as they get all wilted otherwise. we are still reusing bags but in the future I can see making some of our own. We use old string bags at the market for stuff like carrots or potatoes that just need to be weighed. I love this idea. What a great use for an old shower curtain!